We’ve been building a New Mexico tradition since 1980, when Michelle DeWees, a single mom, opened her outdoor stand in mid-town Albuquerque, New Mexico, selling locally made chile ristras. 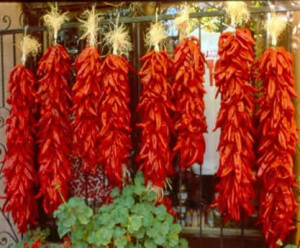 A ristra (say: “REE-straw”), in case you’re not from around here, is a string of dried red chiles used as a decorative accessory in homes throughout the American Southwest. Ristras have a long–and actually very practical–history, having their origin as a method to preserve dried chile, garlic, or onion as dried foodstuffs. But we digress. Michelle operated the original location (San Pedro at Menaul), selling her ristras to the likes of Bloomingdale’s department stores as well as residents and out-of-state visitors, until she closed the stand in 1984. In 1990, Michelle’s son Ken DeWees (who was a teenager in those early years) reopened the stand in a new location near Albuquerque’s Airport–a more convenient stop-over for tourists and businesspeople wanting to bring home their own little slice of the Land of Enchantment. Ken operated his successful ristra business at that location until 1993. Then he had an idea. 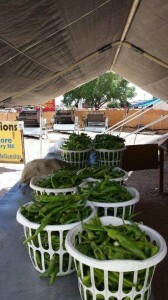 Knowing New Mexicans love their chile, and knowing that the chile grown in Hatch, New Mexico is known as the most flavorful and distinctive on the planet, Ken bought a chile roaster, arranged to purchase fresh seasonal chile from farmers in Hatch, and set up his new business, New Mexico Traditions. A few years later, he would change the name to Chile Traditions. Now we’re building a new tradition. 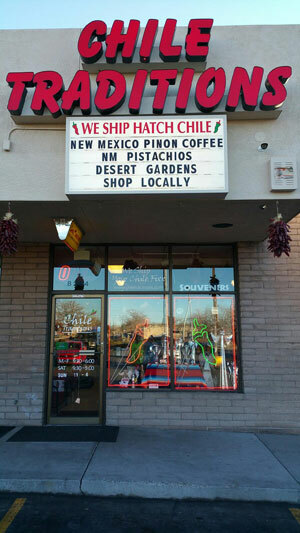 For years, chile aficionados from all over the country have bought world famous fresh seasonal Hatch chile from our iconic outdoor roasting facility in northeast Albuquerque. We invite you to visit our indoor Chile Traditions store (voted top 5 in several categories by independent polls) at 8204 Montgomery Northeast, selling fresh frozen Hatch chile (and just about everything else associated with chile products, hot sauces, and Southwestern décor). The store is open year-round, attracting locals & out-of-town visitors alike. And lovers of all things New Mexico can now shop Chile Traditions from anywhere in the world right here online.